A whopping 85 percent of the matter in the universe is missing, unknown, invisible, and rather fittingly known as dark matter. Since the 1930s, the nature of dark matter has eluded our most sensitive telescopes and underground detectors, but as we hear in this week's podcast, that may all be about to change, thanks to some tantalizing data from telescopes in orbit. Today we talk to Jaco de Swart, a graduate student at the University of Amsterdam researching the history of dark matter, and Robert Sanders, an astrophysicist who remembers when the primary clues of dark matter were first being presented at Princeton and the National Radio Astronomical Observatory. Sanders is also author of The Dark Matter Problem: A Historical Perspective. distance from the galaxy center. 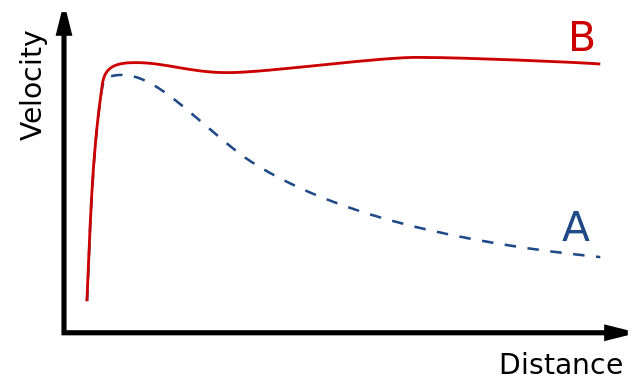 (A) Expected curve. (B) Observed "flat" curve. De Swart and Sanders take us through the history of dark matter, starting with Fritz Zwicky's 1933 finding that the galaxies within clusters of galaxies travel far too fast compared to the expected gravitational force of the cluster. In the 1970s, detailed radio and optical observations found that individual galaxies were also rotating much faster than was thought possible, with leading work presented by Morton Roberts and Vera Rubin. Their "flat rotation curves" of rotation speed against the radius of the galaxy convinced astronomers that some form of extra, invisible mass was necessary to explain the data. That brings us to today and the ongoing hunt for the elusive nature of dark matter. Harry Nelson, physicist at UC Santa Barbara and spokesperson for the LUX-Zeplin experiment in Lead, South Dakota, introduces the WIMP, or weakly-interacting massive particle, which many astronomers believe is the best candidate for a dark matter particle. A WIMP has not yet been found but the LUX experiment and a handful of others are buried deep underground, shielded from background particles and awaiting a tiny vibration or flash of light that might signal a passing dark matter particle. Finally we speak to dark matter theorist Dan Hooper at Fermilab in Chicago about some tantalizing hints of dark matter coming from the center of our Milky Way and some of the open questions in astronomy that he hopes dark matter can address. Top image: A Hubble image of a massive cluster, CL 0024+17, along with the calculated distribution of dark matter, shown in blue. Credit: NASA/Public domain. There is evidence of dark matter every time a double slit experiment is performed; it's what waves. Dark matter has mass. Dark matter physically occupies three dimensional space. Dark matter is physically displaced by the particles of matter which exist in it and move through it. The Milky Way's halo is not a clump of dark matter anchored to the Milky Way. The Milky Way is moving through and displacing the dark matter. The Milky Way's halo is the state of displacement of the dark matter. The Milky Way's halo is the deformation of spacetime. Einstein's gravitational wave is de Broglie's wave of wave-particle duality; both are waves in the dark matter.